Attention Deficit/Hyperactive Disorder (ADHD) is formally known as a neurodevelopmental disorder; this means that the differences in the brain structure, activity, and function occurred sometime during development causing abnormalities in the central nervous system. ADHD does not develop from environmental factors like excess sugar intake, poor parenting, head injuries, or food additives, as has been commonly suggested. The two main categories for ADHD symptoms are hyperactivity and impulsivity. Although, Attention Deficit/Hyperactive Disorder is often diagnosed in children and is, therefore, associated mostly with children, many adults also have ADHD. ADHD often follows an individual into adulthood, because it is a lifetime condition. Children diagnosed with ADHD are more likely to develop substance use disorders as they grow older. Attention Deficit/Hyperactive Disorder and Substance Use Disorders (SUD) have a lot of common symptomatology, which suggests that they may be linked. About 15% of those diagnosed with ADHD have a comorbid diagnosis with a substance use disorder, like alcohol use disorder. People with ADHD are also more likely to develop a dependency of marijuana and nicotine. Since those with Attention Deficit/Hyperactive Disorder are often more impulse, this can contribute to the development of a substance use disorder. There are several treatment methods that people suffering from ADHD can receive. Both cognitive-behavioral therapy (CBT) or family therapy are effective. In family therapy, parents are also involved in helping their child to adjust to life with ADHD and parents are taught ways to help support their child. Through therapy, children can develop skills and strategies to help them improve skills that ADHD might otherwise impede, like time management, goal completion and productivity. Those who have more very severe symptoms that drastically impair their functioning might also consider taking stimulants- a class of drugs that helps regulate brain activity for those with ADHD. 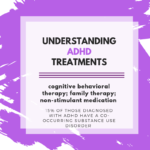 Studies have found that those with ADHD have less activity in certain parts of the brain that regulate motor movement and attention; stimulants help increase activity in the brain to assist with these regulatory behaviors. because of the potential of stimulants to be abused. If you are struggling with your mental health, or you know someone who might be struggling, please feel free to contact the professional team at Lifeline Connections for help! Getting yourself help, whether it is through self-help or by reaching out to professionals is an important part of recognizing that you are struggling; it is also a good step forward in getting the help you need. You can visit or call 360.397.8246 for more information.